There are some things which were left uncleared. For example, I have never suggested to use networks of computers as a substitute for space, with computers as nodes, etc. This is one of the ideas which are too trivial. In the GLC actors article is proposed a different thing. 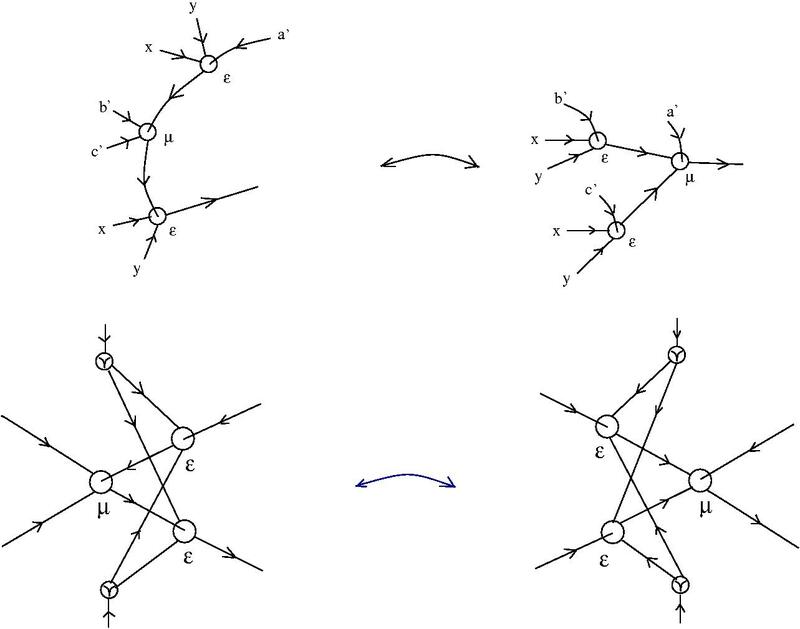 First to associate to an initial partition of the graph (molecule) another graph, with nodes being the partition pieces (thus each node, called actor, holds a piece of the graph) and edges being those edges of the original whole molecule which link nodes of graphs from different partitions. This is the actors diagram. “spatial” where the two molecules, after chemical interaction, change their spatial relation with the neighboring molecules because the actors diagram itself has changed. This was the proposal from the GLC actors article. Now, the first remark is that this explanation has a global side, namely that we look at a global big molecule which is partitioned, but obviously there is no global state of the system, if we think that each actor resides in a computer and each edge of an actor diagram describes the fact that each actor knows the mail address of the other which is used as a port name. But for explanatory purposes is OK, with the condition to know well what to expect from this kind of computation: nothing more than the state of a finite number of actors, say up to 10, known in advance, a priori bound, as is usual in the philosophy of local-global which is used here. apply only to sub-riemannian, but seems to be something more general, of a computational nature, but which computation, etc). The closeness, i.e. the neighbourhood relations themselves are a global, a posteriori view, a static view of the space. In the Quick and dirty argument for space from chemlambda I propose the following. Because chemlambda is universal, it means that for any program there is a molecule such that the reductions of this molecule simulate the execution of the program. Or, think about the chemlambda gui, and suppose even that I have as much as needed computational power. The gui has two sides, one which processes mol files and outputs mol files of reduced molecules, and the other (based on d3.js) which visualizes each step. “Visualizes” means that there is a physics simulation of the molecule graphs as particles with bonds which move in space or plane of the screen. Imagine that with enough computing power and time we can visualize things in as much detail as we need, of course according to some physics principles which are implemented in the program of visualization. Take now a molecule (i.e. a mol file) and run the program with the two sides reduction/visualization. Then, because of chemlambda universality we know that there exist another molecule which admit chemlambda reductions which simulate the reductions of the first molecule AND the running of the visualization program. So there is no need to have a spatial side different from the chemical side! But of course, this is an argument which shows something which can be done in principle but maybe is not feasible in practice. indeed, that is because of the evolution equation differential operators, which are always limits of conjugations of dilations, and because of the algebraic structure of the space, which is also described as a limit of dilations combinations (notice that I speak about the vector addition operation and it’s properties, like associativity, etc, not about the points in the space), and finally because of an a priori assumption that functions like the hamiltonian are computable themselves. This recipe itself is alike a chemlambda molecule, but consisting not only of A, L, FI, FO, FOE but also of some (two perhaps) dilation nodes, with moves, i.e. graph rewrites which allow to pass from a step to another. The symplectic structure itself is only a shadow of a Heisenberg group structure, i.e. of a contact structure of a circle bundle over the symplectic manifold, as geometric prequantization proposes (but is a mathematical fact which is, in itself, independent of any interpretation or speculation). I know what is to be added (i.e. which graph rewrites which particularize this structure among all possible ones). Because it connects to sub-riemannian geometry precisely. You may want to browse the old series on Gromov-Hausdorff distances and the Heisenberg group part 0, part I, part II, part III, or to start from the other end The graphical moves of projective conical spaces (II). Hence my proposal which consist into thinking about space properties as embodied into graph rewriting systems, inspred from the abstract nonsense of emergent algebras, combining the pure computational side of A, L, etc with the space computational side of dilation nodes into one whole. In this sense space as an absolute or relative vessel does not exist more than the Marius creature (what does exist is a twirl of atoms, some go in, some out, but is too complex to understand by my human brain) instead the fact that all beings and inanimate objects seem to agree collectively when it comes to move spatially is in reality a manifestation of the universality of this graph rewrite system. argument by example that it is possible that nature works like this. I mean that chemlambda shows that there exist a formalism which can do this, albeit perhaps in a very primitive way. The second belief I have is that regardless if nature functions like this or not, at least chemlambda is a proof of principle that it is possible that brains process spatial information in this chemical way. In the frame of chemlambda and g-patterns, here is how not to do the beta move. We pass from chemlambda to a slightly enlarged version, see the graphical formalism of projective conical spaces, which would correspond to an only local moves version of the whole GLC, with the emergent algebra nodes and moves. Then we do emergent algebra moves instead. Remark that I don’t do the beta move, really. In g-patterns the epsilon beta move does not replace the LEFT pattern by another, only it ADDS TO IT. Here, of course, epsilon[g,i,d] is the new graphical element corresponding to a dilation node of coefficient epsilon. and we get back the original g-pattern. that’s it the BETA MOVE is performed! What is the status of the first reduction from the figure? Hm, in the figure appears a node which has a “0” as decoration. I should have written instead a limit when epsilon goes to 0… For the meaning of the node with epsilon=0 see the post Towards qubits: graphic lambda calculus over conical groups and the barycentric move. However, I don’t take the barycentric move BAR, here, as being among the allowed moves. Also, I wrote “epsilon goes to 0”, not “epsilon=0”. the beta move pattern is still present after the epsilon BETA move, what happens if we continue with another, say a mu BETA move, for a mu arbitrary? what happens if we do a reverse regular BETA move after a epsilon beta move? why consider “epsilon goes to 0” instead of “epsilon = 0”? can we do the same for other moves, like DIST, for example? Continues from The graphical moves of projective conical spaces (I). In this post we see the list of moves. The colours X and O are added to show that the moves preserve the class of graphs PROJGRAPH. The drawing convention is the following: columns of colours represent possible different choices of colouring. In order to read correctly the choices, one should take, for example, the first elements from all columns, as a choice, then the second element from all columns, etc. When there is only one colour indicated, in some places, then there is only one choice for the respective arrow. Finally, I have not added symmetric choices obtained by replacing everywhere X by O and O by X. As you see, there is only one PG move. There are 3 different choices of colours, which results into 3 versions of the PG move, as explained in the post A simple explanation with types of the hexagonal moves of projective spaces. Look at the chemlambda DIST moves to see that this move is in the same family. This is a projective version of the GLC move R1 (more precisely R1a). The name comes from “Reidemeister 1” move, as seen through the lens of emergent algebras. This is a projective version of the GLC move R2 . The name comes from “Reidemeister 2” move. This is a projective version of the GLC move ext2. 6. CO-COMM, CO-ASSOC and LOC PRUNING. These are the usual moves associated to the fanout node. 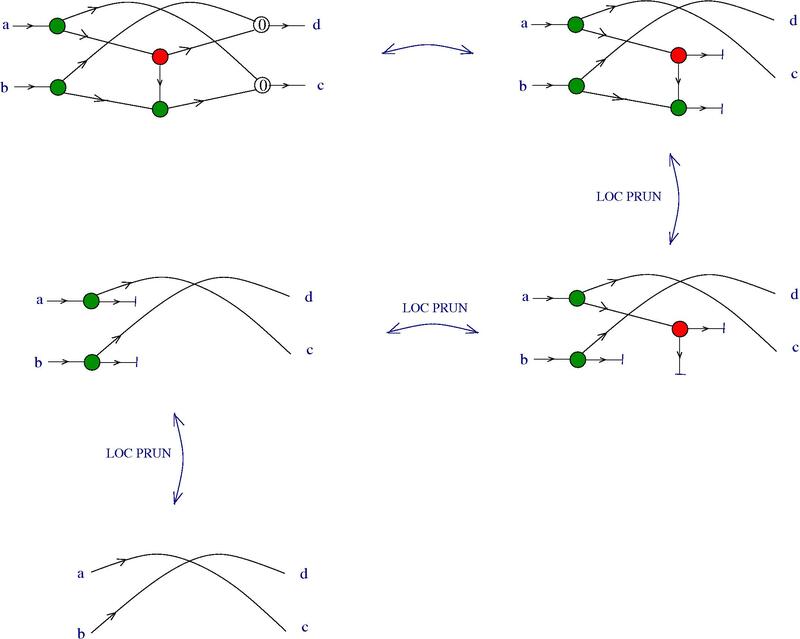 The LOC PRUNING move for the dilation node is also clear. All these moves are local! This post continues from A simple explanation with types of the hexagonal moves of projective spaces . Here I put together all the story of projective conical spaces, seen as a graph rewriting system, in the same style as (the emergent algebra sector of) the graphic lambda calculus. What you see here is part of the effort to show that there is no fundamental difference between geometry and computation. simply by adapting the Distributed GLC model for this graph rewriting system, thus transforming the moves (like the hexagonal moves) into interactions between actors. with 1 incoming arrow and the remaining 3 (two incoming and 1 outcoming) . Moreover, there is a cyclical order on those 3 arrows. Each dilation node is decorated by a Greek letter like , which denotes an element of a commutative group . The group operation of is denoted multiplicatively. Usual choices for are the real numbers with addition, or the integers with addition, or the positive numbers with multiplication. But any commutative group will do. as well as loops with no node. there are also 3 valent nodes, called “fanout nodes”, with one incoming arrow and two outcoming arrows, along with a cyclic order of the arrows (thus we know which is the outcoming left arrow and which is the outcoming right arrow). 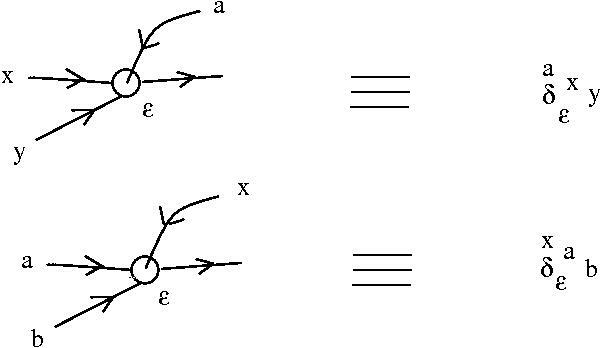 moreover, there is a 1-valent termination node, with only 1 incoming arrow. there are 2 more incoming arrows coloured like the outcoming arrow. I shall call this colours “O” and “X”, think about them as being types, if you want. What matters is when two colours are equal or different, and not which colour is “O” and which is “X”. the 4 arrows of a 4 valent dilation node are coloured such that the special 1 incoming arrow is coloured differently than the other 3 arrows. With the colour indications, we can simplify the drawing of the 4 valent nodes, like indicated in the examples from this figure. Thus, the condition that a graph (made of 4 valent and 3 valent nodes) is in PROJGRAPH is global. 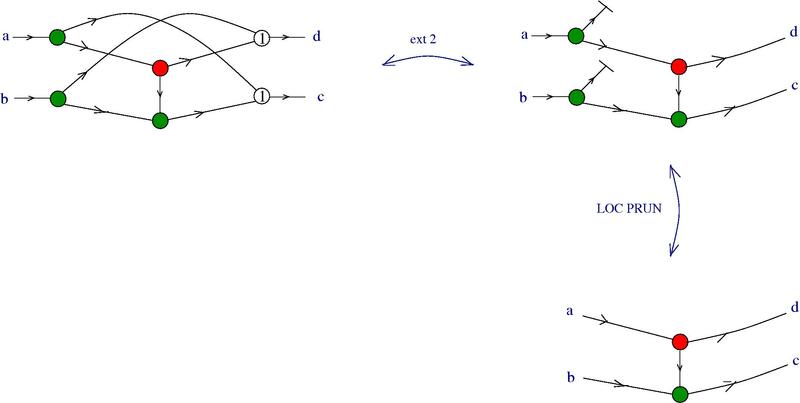 That means that there is no a priori upper bound on the number of nodes and arrows which have to be checked by an algorithm which determines if the graph is in PROJGRAPH. In the next post we shall see the moves, which are all local. This post continues from the previous A beautiful move in projective spaces . I call those “beautiful” moves hexagonal. So, how many hexagonal moves are? In the post Axioms for projective conical spaces (towards qubits II) I give 4 moves and I mention that I discard other two moves, because don’t see their use in generalized projective geometry. By looking at the hexagonal moves from the last post, we see that there are only three ways of decorating the common part of all diagrams with types. This gives 3 hexagonal moves. This is explained in the next figure (click on it to make it bigger). We see that some arrows are decorated with one type (arbitrarily called “x”) and other arrows are decorated, apparently with columns of 3 types. In fact, that should be read as 3 possibilities, which correspond to taking from each column the first, the second or the third element. The choice corresponding to the second element of each column corresponds to (PG2). The choice corresponding to the third element of each column corresponds to (PG1). Remarking that the rule of decoration with types is symmetric with the switch between the types “a” and “x”, this corresponds to the 6 moves of generalized projective geometry. 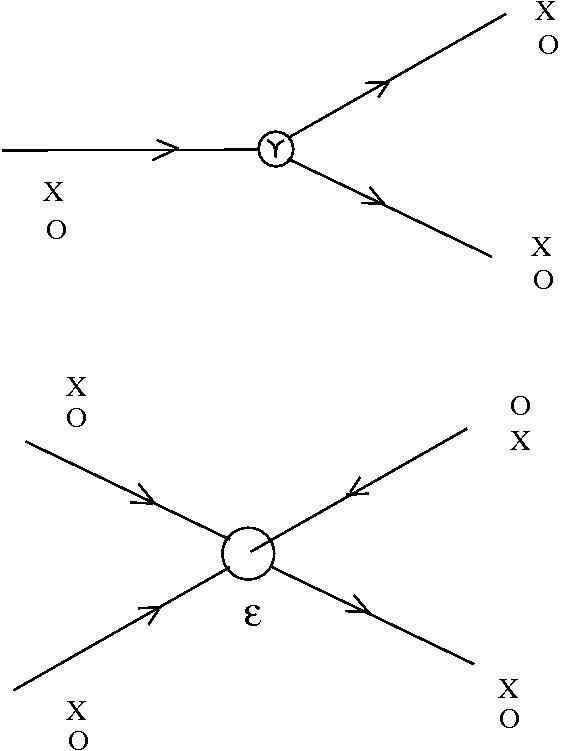 In conclusion, by selecting only those graphs (and moves) which can be decorated in the mentioned way with two types, we get the moves of generalized projective geometry. The post Axioms for projective conical spaces (towards qubits II) introduces a generalization of projective spaces to projective conical space. These are a kind of non-commutative version of projective spaces, exactly in the same sense as the one that affine conical spaces are a non-commutative generalization of affine spaces. Now, the beautiful thing is that all the 4 axioms of projective conical spaces have the same form, if represented according to the same ideas as the ones of graphic lambda calculus. There will be more about this, but I show you for the moment only how the first part of (PG1) looks like, in the original version and in the new version. Here is the first part of (PG2) in old and new versions. affine conical spaces are the non-commutative equivalent of affine spaces. An affine conical space is constructed over a conical group as an affine space is constructed over a vector space. Conical groups are generalizations of Carnot groups, in the sense that in the realm of Lie groups the basic example of a conical group is a Carnot group. A conical Lie group is a contractive Lie group and therefore, by a theorem of Siebert, if it is simply connected then it is a nilpotent Lie group with a one-parameter family of contractive automorphisms. Carnot groups (think about examples as the Heisenberg group) are conical Lie groups with a supplementary hypothesis concerning the fact that the first level in the decomposition of the Lie algebra is generating the whole algebra. an affine conical space is an usual affine space if and only if it satisfies the barycentric move. In this case and only in this case the underlying structure of the conical group is commutative.See arXiv:0804.0135 [math.MG] for the introduction of “non-commutative affine geometry”, called here “affine conical geometry”, which generalizes results from W. Bertram Generalized projective geometries: From linear algebra via affine algebra to projective algebra, Linear Algebra and its Applications 378 (2004), 109 – 134.
afine conical spaces are defined in terms of a one-parameter family of quandle operations (called dilations). More specifically an affine conical space is generated by a one-parameter family of quandles which satisfy also some topological sugar axioms (which I’ll pass). More precisely, affine conical spaces are self-distributive uniform idempotent right quasigroups. 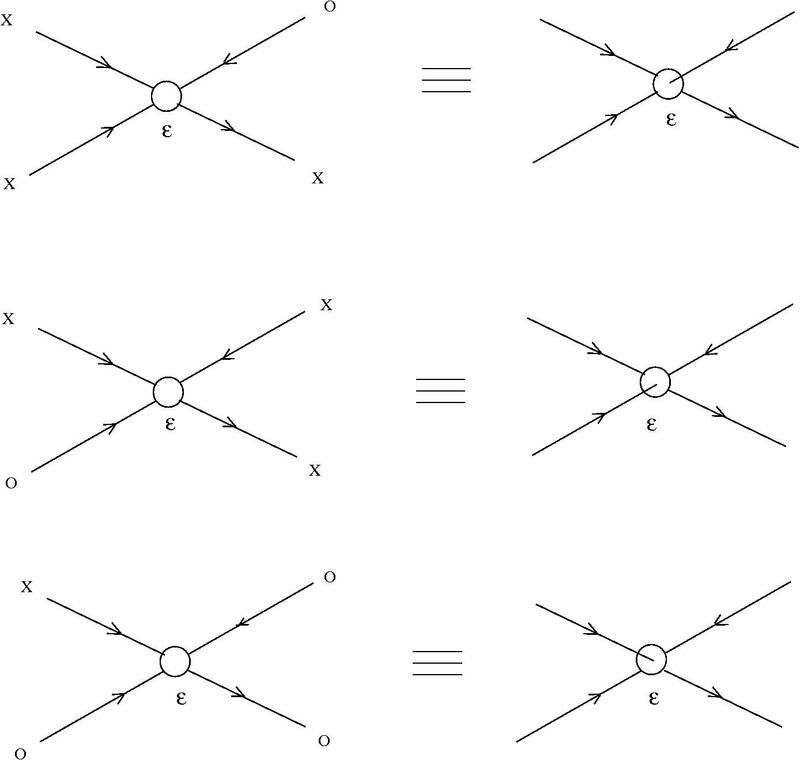 Uniform idempotent right quasigroups were introduced and studied under the shorter name “emergent algebras” in arXiv:0907.1520 [math.RA], see also arXiv:1005.5031 [math.GR] for the context of studying them as algebraic-topologic generalizations of dilation structures (introduced in arXiv:math/0608536 [math.MG]), as well as for the description of symmetric spaces as emergent algebras. in affine conical geometry there is no notion of incidence or co-linearity, because of non-commutativity lurking beneath. However, there is a notion of a collinear triple of points, as well as a ratio associated to such points, but such collinear triples correspond to triples of dilations (see further what “dilation” means) which, composed, give the identity. Such triples give the invariant of affine conical geometry which corresponds to the ration of three collinear points in the usual affine geometry. In the post Towards qubits I I explained (or linked to explanations) this in the language of graphic lambda calculus. Here I shall not use it fully, instead I shall use a graphical notation with variable names. But I think the correspondences between these two notations are rather clear. In particular I shall interpret identities as moves in trivalent graphs. 1. Algebraic axioms for affine conical spaces. (Topological sugar not included). We have a non-empty set and a commutative group of parameters with operation denoted multiplicatively and neutral element . Think about as being or even where is a field. Combinations (i.e. compositions) of dilations appear therefore as oriented trees with trivalent planar nodes decorated by the elements of , with leaves (but not the root) decorated with elements from . The algebraic axioms of affine conical spaces are stating identities between certain compositions of dilations. Graphically these identities will be representes, as I wrote, as moves applied to such oriented trees. 2. Algebraic axioms for projective conical spaces. The intention is to propose a generalization of the same type, this time for projective spaces, of the one from W. Bertram Generalized projective geometries: General theory and equivalence with Jordan structures, Advances in Geometry 3 (2002), 329-369. This time we have a pair of spaces . Think about the elements as being “points” and about the elements as being “lines”, although, as in the case of affine conical geometry, there is no proper notion of incidence (except, of course, for the “commutative” particular case). A pair geometry is a triple where is the set of pairs (say point-line) in general position. Compared to the more familiar case of incidence systems, the interpretation of is “the point is not incident with the line “. The triple satisfies some conditions which I shall write after introducing some notations. (Pair geometry 2) for any pair of different points there exists and it’s unique a line such that and are not in ; dually, for any pair of different lines there exists and it’s unique a point such that and are not in . Remark. This is the definition of a pair geometry given by Bertram. I shall keep further only (Pair geometry 1) because I feel that (Pair geometry 2) has too much “incidence content” which might be not non-commutative enough. So, for the moment, (Pair geometry 2) is in quarantine. As a first suggestion coming into mind, it might well turn out that it can be replaced by a more lax version saying that there is a number such that is covered by the reunion of sets (and a similar dual formulation for . As it is, (Pair geometry 2) corresponds to such a formulation for . these structures are glued together by some axioms. Let’s pass through these three points of the list. which, for any it takes a pair of lines , with and returns . We ask that for any the dilations satisfy axioms (1), (2), (3) of affine conical spaces. which, for any it takes a pair of points , with and returns . 3. the gluing axioms are generalizations of axioms (PG1), (PG2) of Bertram. In the mentioned article, Bertram explains that these two axioms lead to eight identities. From those eight, six of them are different. From those six, Bertram is using the barycentric axiom to eliminate two of them, which leaves him with four identities. I shall not use the barycentric axiom, because otherwise I shall fall on the commutative case, but I shall eliminate as well these two axioms> Therefore I shall have four moves which will replace the Reidemeister move 3 axiom , i.e. the self-distributivity move (4) from affine conical spaces. Remark. Bertram adds some sugar over (PG1) and (PG2) which serves to be able to construct tangent structures further. I renounce at those in favor of my topological sugar which I pass, for the moment. Remark. As we saw that the axioms of affine conical spaces are practically corresponding to the Reidemeister moves, it is natural to expect that the four axioms correspond to either: the Roseman moves, or to some 2-quandle definition. I need help and suggestions here! I shall write further the four axioms which replace the axiom (4), that is why I shall name them (4.1) … (4.4). As previously I shall use a graphical notation, which my visual brain finds more easy to understand than the notation using multiple compositions of functions with 4 arguments (however, see Bertram’s notations involving adjoint pairs). Also, there are limits to my capacity to write latex formulae which are well parsed in this blog. Let’s look at the first line. For any we have an associated dilation operation taking as input a pair of points . Graphically this is represented by a node with two inputs and an output, together with a planar embedding (i.e. the local planar embedding tells us which is the left input and which is the right output), and with a supplementary input which points to the center of the circle (node), serving to identify the node as the dilation in the space . Similar comments could be made about the second line of the figure. Therefore, this time we are working with trees made by 4-valent nodes, each node having three inputs and one output and moreover with a triple of two inputs and the output with an orientation given. The leaves, but not the root of such a tree are decorated by points or lines. There should be other constraints on this family of trees, coming from the fact that if the input which points to the center of the circle correspond to a point then the other inputs should correspond to lines, and so on. For the moment I pass over this, probably a solution would be to colour the edges, by using two colors, one for points, the other for lines, then express the constraints in terms of those colors. 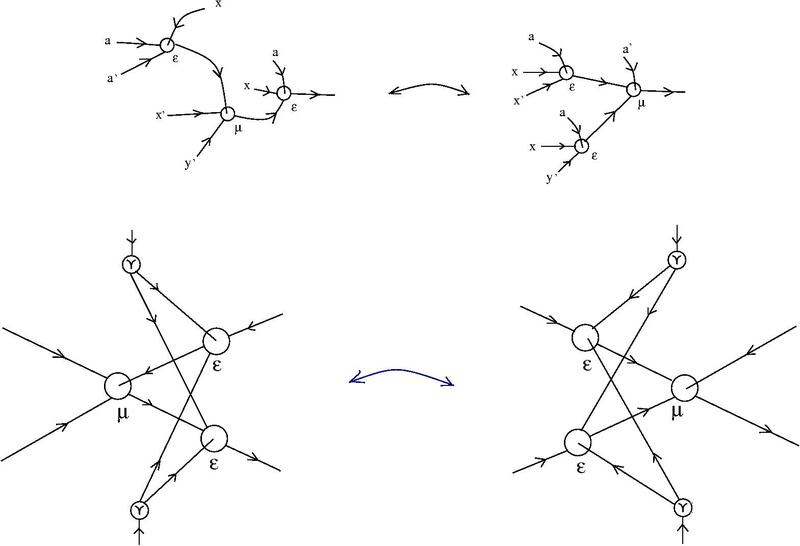 As previously, the nodes are decorated by elements of the commutative group . examples of non-commutative projective conical spaces, in particular answering to the question: what is the natural notion of a projective space of a conical group (more particularly, if we think about Carnot groups as being non-commutative vector spaces, then who are their associated non-commutative projective spaces?). UPDATE: The axioms (4.1) … (4.4) take a much more simple form if we use choroi and differences, but that’s also for a future post.